When I'm hankering for a delicious steak, Hog's is the first place I head. Their juicy, prime rib, slow cooked steaks are the perfect meal to sate the appetite. 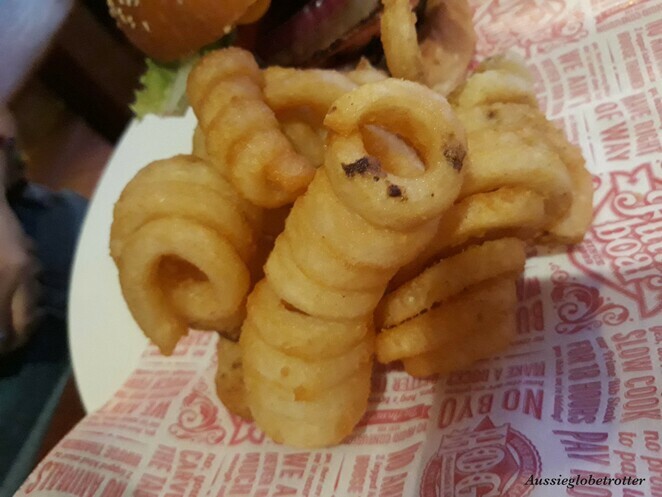 The Hog's menu is huge and features a range of meals including their signature steaks, burgers, ribs, salads, wraps, seafood and pasta. As their 18-hour slow-roasted prime rib is usually my meal of choice, I jumped at the chance to try something new and review the Hog's Australia Day Steak Burger Bun-nanza. It seems apt that this great Australian steakhouse has created a range of burgers for Australia Day. 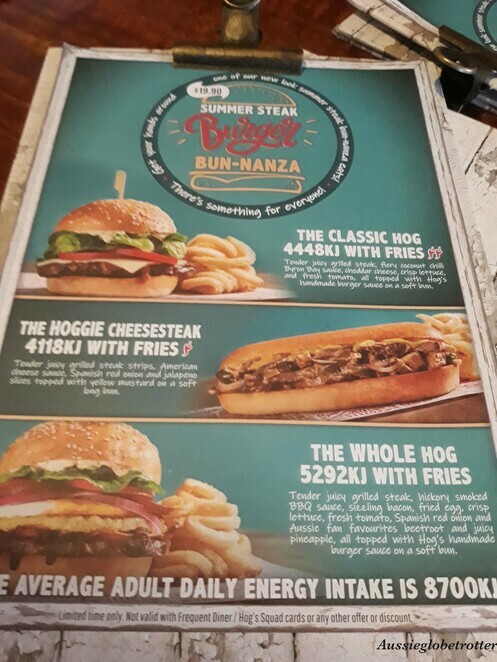 Three burger's feature - The Classic Hog, The Hoggie Cheesesteak and The Whole Hog. The Classic Hog has bite with its fiery chilli Byron Bay sauce. The juicy grilled steak is topped with cheddar cheese, lettuce, tomato and Hog's special burger sauce and it will have your taste buds dancing. Inspired by Philadelphia, The Hoggie Cheesesteak is served on a long soft bun with tender grilled steak strips, American cheese sauce, Spanish red onion, jalapeno slices and yellow mustard. The pièce de résistance is The Whole Hog. Succulent grilled steak, hickory smoked BBQ sauce, sizzling bacon, fried egg, lettuce, tomato, Spanish red onion, beetroot and pineapple will have your stomach smiling. 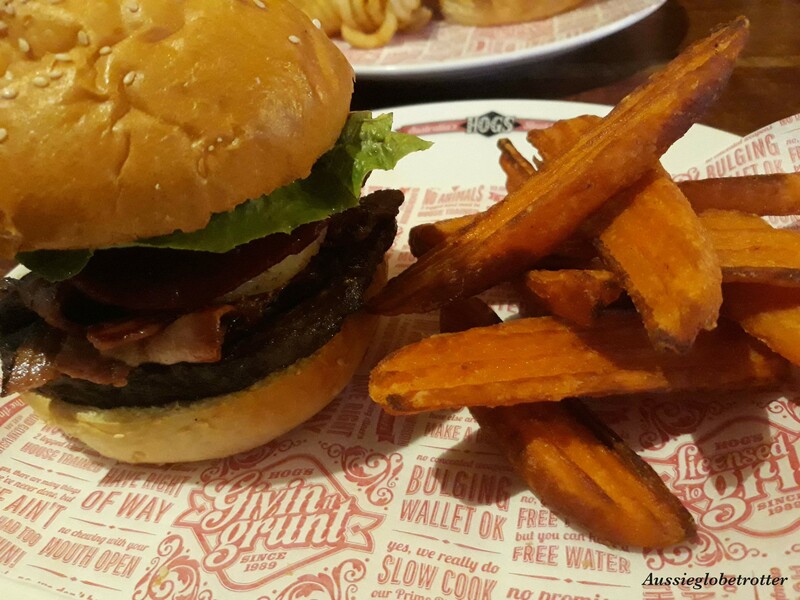 Look no further for the best steak burger, this is it! The beef was cooked to perfection and the combination of flavours was divine. 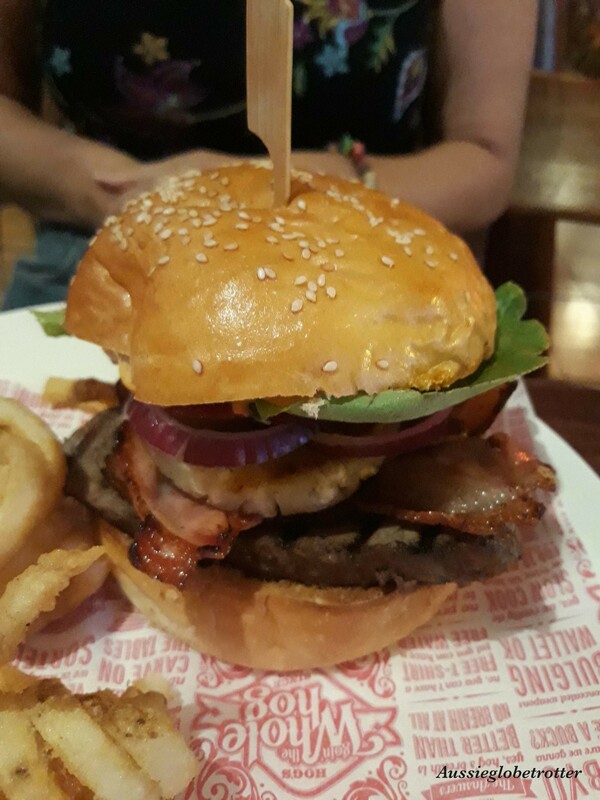 My friend summed this burger up perfectly, it was the best burger she had ever tasted. These great tasting burgers are amazing value at $19.90 and are served with either Hog's signature curly fries or sweet potato wedges. 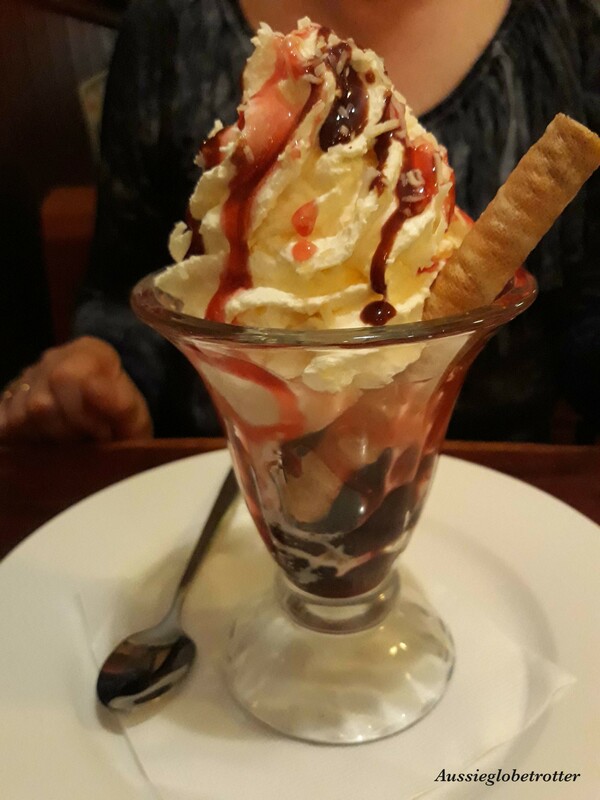 Ensure you save room for dessert. To continue with the Australian Day theme, why not try the Lamington Ice Cream Sandwich, a Lamington filled with vanilla and strawberry ice-cream and drizzled with chocolate sauce and raspberry puree or the Aussie Mango and Passionfruit Mess with its peach, mango and passionfruit compote, crushed meringues, raspberry puree, whipped cream, vanilla ice cream, toasted coconut and biscuit crumbs? 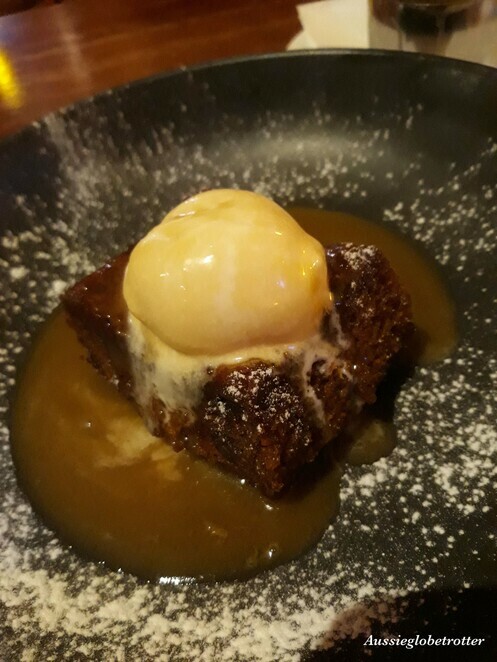 Other desserts include the decadent Mississippi Mud Cake, Rocky Road Sundae and my favourite, the Sticky Date Pudding. The warm homemade pudding is served with a pot of butterscotch sauce and vanilla ice cream. All deserts except the Boss Hog™ Rocky Road Sundae to Share are $10.95. The $17.95 Boss Hog™ Rocky Road Sundae to Share is huge - 8 scoops of vanilla and strawberry ice cream are served on a warm chocolate mud cake. This is then covered in chocolate fudge sauce, strawberry topping, whipped cream and topped with coconut, marshmallows and chocolate wafers. 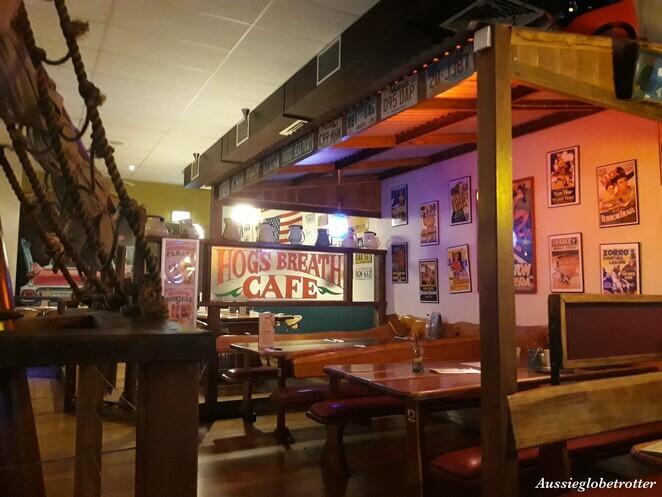 The informal and comfortable atmosphere at Hog's combined with great prices, exceptional food and friendly and attentive staff, makes this a restaurant to visit. The Australian Day Steak Burger Bun-nanza is available for a limited time. They won't be around for long so head to one of the 75 locations across Australia today. Ok I'm hungry now. Yum!